SC17-1493 Anil Desai, M.D. v. Lawnwood Medical Center, Inc.
St. Lucie County – starts about 9:00 a.m.
Dr. Desai, a pathologist at the Lawnwood Medical Center, was denied reappointment to the Medical Staff by the Board of Trustees’ Recredentials Committee. Dr. Desai sued Lawnwood claiming the denial violated Medical Staff Bylaws. The trial court dismissed the lawsuit because Dr. Desai did not follow administrative procedures for appealing the Board’s decision before filing his lawsuit. On appeal, the Fourth District Court of Appeal agreed with the trial court. Dr. Desai now asks this Court for review. Collier County – starts about 9:40 a.m.
Mr. Damas was convicted of the first-degree murders of his wife, Guerline Damas, and his five children, who were killed in 2009. The trial court condemned him to death. This is his direct appeal. Duval County – starts about 10:30 a.m.
Mr. King was convicted of murder in the first degree of Renie Telzer-Bain, who was beaten to death in 2009. The jury voted 8-4 to recommend a death sentence, and the trial court condemned him to death. This Court upheld his sentence on direct appeal. Mr. King filed a post-conviction challenge in trial court. It was denied, and this appeal followed. He raises several claims of ineffective assistance of counsel. Lee County – starts about 11:10 a.m.
Lee Memorial provided medical care to a patient who suffered injuries when struck by a motor vehicle while riding his bicycle. Lee Memorial filed liens to recover unpaid hospital costs and sued Progressive Insurance for payment. Lee Memorial relied on Florida law that authorized the liens for recovery of costs of medical services. The trial court found in favor of Progressive Insurance when it declared the Florida law unconstitutional. The Second District Court of Appeal agreed with the trial court. Lee Memorial asks this Court for review because the district court decision declared a state statute invalid. SC18-1573 League of Women Voters of Florida, et al. v. Rick Scott, Governor, et al. The League of Women Voters petitioned this Court challenging the governor’s authority to begin the nomination process to fill judicial vacancies before the vacancies occur. 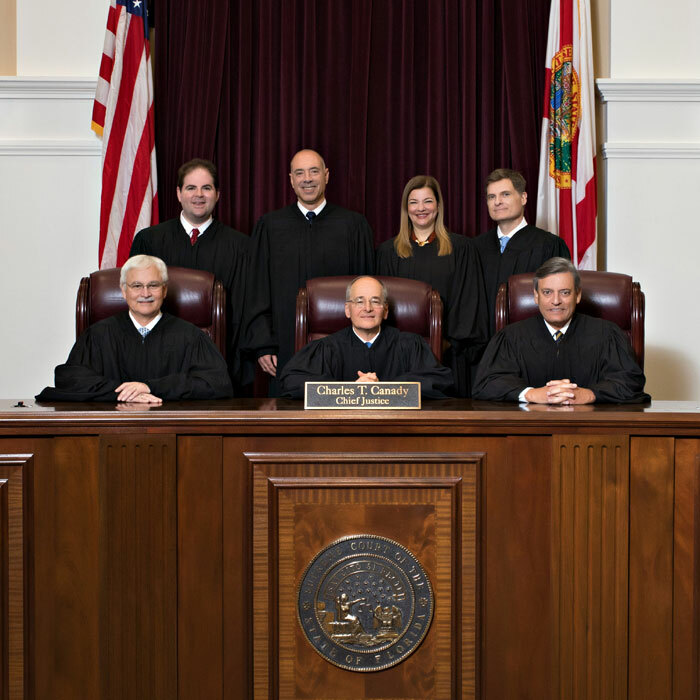 On October 15, 2018, this Court ruled Governor Scott exceeded his authority when he imposed a deadline for the Supreme Court Judicial Nominating Commission to submit nominations for upcoming supreme court vacancies. Additional issues remain regarding the nominating process. SC18-67 Citizens for Strong Schools, Inc., et al. v. Florida State Board of Education, et al. Leon County – starts about 10:00 a.m.
Citizens for Strong Schools filed a lawsuit against the Florida State Board of Education and others claiming the State had not met its paramount duty to make adequate provision for a uniform, efficient, and high-quality system of free public schools, as required by the Florida Constitution. The trial court concluded that the issues raised by Citizens for Strong Schools are not subject to judicial review. The First District Court of Appeal agreed with the trial court and this appeal followed. SC18-79 Orange County, Florida v. Rick Singh, etc., et al. Orange County – starts about 10:50 a.m.
An amendment to the Orange County Charter provides for term limits and nonpartisan elections for county constitutional officers. Three of the county constitutional officers, including Rick Singh, challenged the amendment in court. The trial court struck down the nonpartisan election provision because it was preempted by Florida law. The Fifth District Court of Appeal affirmed the trial court, and this appeal followed.